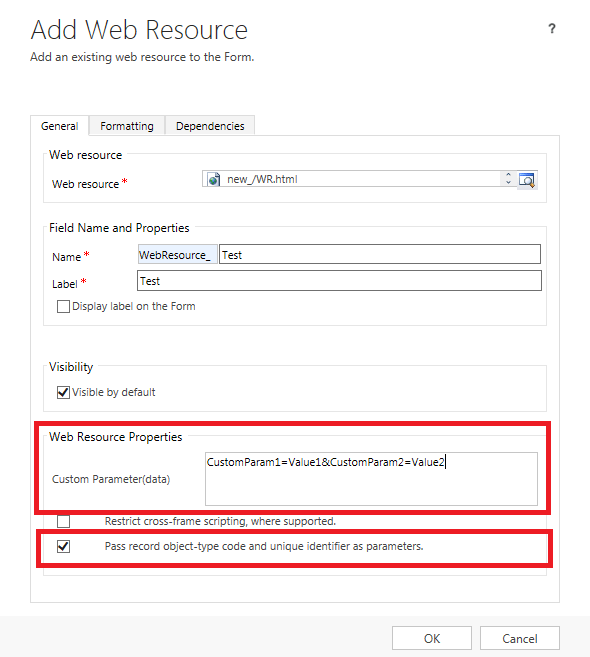 We (developers) have a great feature in CRM 2011 release. If you want to give your CRM application new client side features or controls not available OOB and you want your solution to remain supported, you have to use HTML/JS webresources. This article describes some approaches, tricks and code snippets I found or developed while using HTML/JS webresources. Obviously, if parameters.id equals null that means that user creates a record or you haven’t checked the ‘Pass record object-type code and unique identifier as parameters’ checkbox. So if you are sure that you have checked the checkbox and that the id is null, the webresource wil be executed in a context of create form. As you can see – that work perfectly! var originAttribute = context.getEventSource();//Attribute that was changed on a form. var callDepth = context.getDepth();//get depth of a call. Next Why my action is not available through WebApi? Hello Andrey! Thanks for the article. 1. So you’ve sent two parameters with the static values like “CustomParam1 = Value1”, but if I need to pas params dynamically ? Can you describe this method? 2. What if I need to pass a rich text variable like XML content or Base64 string, how can I pass data in this case ? Thank you, Andrew. I’ll try it!